Swim Spas offer a great combination of exercise, therapy, relaxation and family fun. But choosing one can be difficult. The models and features vary widely and it is not easy to see the differences just by looking at them. Also there's a lot of misleading information out there from over zealous sales people, the internet and even the manufacturers themselves. Here is our best attempt to help you cut through the sales and marketing noise. Swim spas (also known as swimming hot tubs) fall into different classes based on their vessel types and current generation systems. Acrylic - has a nice 'spa' type finish with textured designs. Fiberglass - usually white (but can be colored), has a high-end appearance and can be easily repaired. They can have inlaid waterline tiles. Some are cut into large pieces with gasket seals to allow installation in existing spaces. Steel Panels and Vinyl Liner - this is the tried and true solution to most backyard pools applied to spas. It is a modular design (which means it may be easier to install in existing indoor spaces) and offers a variety of liner designs. All three vessel types work fine. If you are installing in existing indoor space, consider the steel panels and vinyl liner. If your swim spa will be outdoors, it comes down to personal choice: which one will be easier to install, how do the costs compare, and which aesthetic do you like better? Current Generation - If you are interested in exercising in your swim spa, this is where the models vary the most. Paddlewheel - a long paddle that spans the width of the pool is turned by an electric motor. This creates a smooth, wide, but shallow current the width of the spa (i.e. there is no way to get out of the current). Propeller - a propeller is turned using an electric motor or hydraulic system. These systems vary in design and effectiveness. The best units use custom designed composite propellers (believe it or not, this can provide a more efficient flow than a welded steel design. It does require a capital investment which some of the smaller swim spa manufacturers are unable to do). 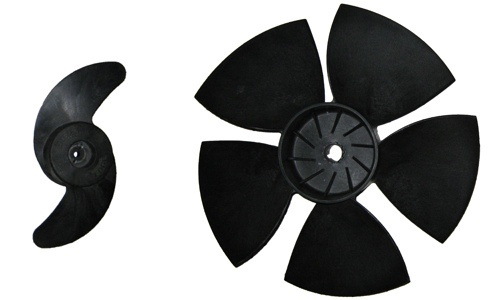 Larger propellers in general move more water than smaller propellers. For example, some swim spas use small propellers designed for trolling motors on boats. Jets - an electric pump moves water through plastic piping to jet nozzles in the swim spa. These are ideal for recreation and casual exercise, jets create a resistance flow similar to swimming against a strong hose. 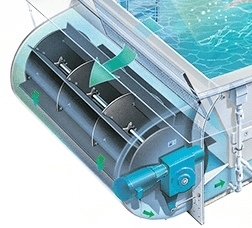 Some swim spas use grills and turning vanes to direct and smooth the current as it circulates. Power - Most swim spa manufacturers talk about the horsepower of their motors. This is the only way they have to quantify the power of the current - but it is close to irrelevant. So many other factors go into the current generation system. Some 7.5 hp systems are weaker that 5 hp system. The only way to determine the quality and power of the current is to take a test swim. Speed Increments - Many of the jetted swim spas change the speed by turning on and off jets (offering few speed levels), higher end swim spas offer over 50 levels of current speed. Be careful, there are misleading claims. For example, one big name spa manufacturer has a product line with speed from 0 to 60 - this really means 6 speeds (10,20,30,40,50 and 60). Bench Layout - swim spas have different seating configurations and different shapes to their seats. The best configuration is a matter of personal choice. Massage Jets - models vary in the number and placement of jets. To figure out what works best for you, you need to get in the spa. More jets cost more money, may add maintenance costs and don't necessarily add to the value of the swim spa. Lights - can make the night time use more enjoyable. They also are a valuable safety tool if small children are swimming at night. Covers - a cover is critical for safety, keeping in humidity and heat and keeping out debris. If heat retention is not an issue, manual or autocovers on tracks will do well. If you need an insulated cover, they often come in sections and can use cover lifters. Be sure to try out covering and uncovering the swim spa before you buy to be sure you have the strength to do it. Water Quality System - this is the system that filters and heats the water. Usually one controller will manage the temperature, lights and jets. With the heaters, you have a choice of gas, propane or electric. VGB Compliance - The Virginia Graham Baker Act created safety requirements for drains on pools and spas. 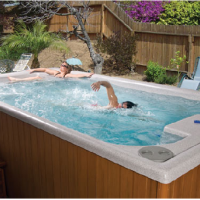 Swim spas that are compliant have larger intake grills, special drains and redundant plumbing to avoid suction entrapment. Ask if the swim spa is compliant. Customer Service - if you buy from a local dealer, they will be your first point of contact for service. Choose a shop nearby with people you like. If you buy direct or are unhappy with your local dealer, you will be contacting the manufacturer. Most manufacturers have good customer service departments. The few with issues are usually apparent by reading their BBB reports. Also, I would be very skeptical about buying product manufactured in China. Treadmills - both manual and powered are available. Manual treadmills are one of the most commonly returned items. They work, but take a little time to get used to. Powered treadmills offer a wide range of workouts but are more expensive. 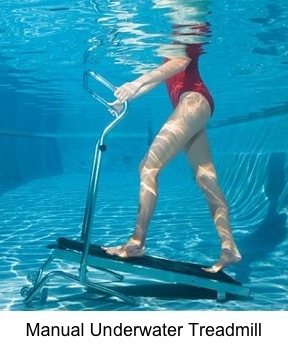 A treadmill can double the uses and value of a swim spa, but you should try it out before purchase. Exercise Bands - these photograph well and help sell the swim spa, but most people don't regularly use after purchase. 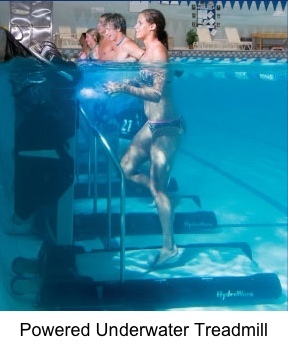 The exercises don't depend on the water and are better done with other equipment. Waterfalls - a feature that helps sell the swim spa dream, but not often used after purchase. Built In Radios - another sales tool to sell the dream. They are typically expensive to buy and to repair. Determine the type of user you will be -- Leisure or Exercise. If you plan to use the swim spa / swimming hot tub for exercise then the current matters. Focus on propeller and paddlewheel models. Compare the current across several models and manufacturers. Think about where will you put the swim spa -- indoors or outdoors? Indoors will save on heating costs and may offer a better year-round solution. Outdoor may offer a relaxing experience with views of scenery and the sky. If inside, focus on steel panel and vinyl liner swim spas. If outdoors, think about the installation (in ground, above ground, decking, etc. ), required insulation and aesthetic. Check out a few direct and / or local dealers. Be sure to read their BBB reports. Magazines and forums are good sources of information, but be very skeptical. Magazines won't show unfavorable information because they need every manufacturers' ad revenue. Many of the online forums and manufacturers show blatantly misleading information. Try out a few spas. Would you buy a new car without taking a test drive? A swim spa can cost as much as a new car and the experience between manufacturers can vary widely. Dealers expect customers to ask for test swims.